I have a love / hate relationship with software synths. It seems everyone makes one and most of them sound like those old midi ringtones cell phones used to have. Also everyone claims that theirs replicates “vintage synth sounds” but all they seem to do is throw a low pass filter on the preset and call it good. Don’t get me started on the user interfaces. I see too many companies controls overlooked and your experience suffers for it. I know it has nothing to do with sound, but the look and feel of a program can definitely make it more enjoyable to use. So basically to sum up my rant, I am very picky with soft synths. Tone2 is a European company that is behind the scenes in more areas than most audio software manufacturers. When your resume includes BMW, Disney, and a medical facility for “particle acceleration,” you’ve got my attention. Someone else who has been documented as having their full attention is Skrillex (He uses Gladiator). So when Tone2 sent me over a copy to get my hands on this new “best of both worlds synth,” I immediately jumped at the opportunity. 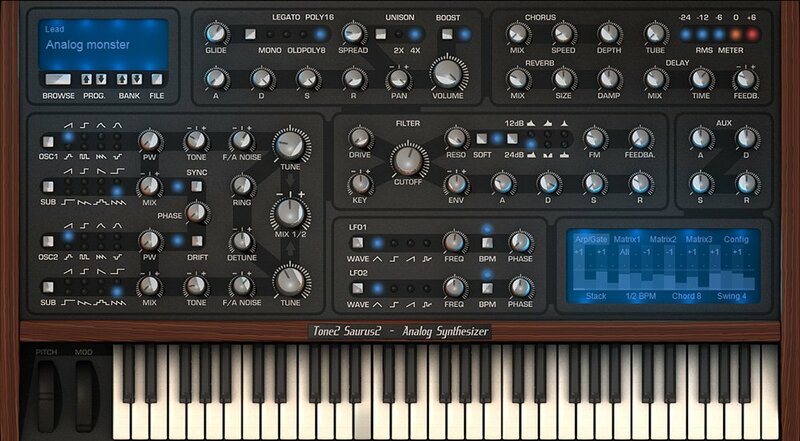 Saurus is a VST / VSTi / AU virtual synth that works in both 32 and 64 bit environments. It implements what Tone2 calls “True Analog Modeling Technology”, a system they themselves have created. This gives the synth, its old school street cred with the warm analog sound we have all decided we want again after the sterile synth debacle of the mid to late 90’s. They have also implemented quite a few distinct types of filters to add to the already great analog sound you can get from this piece of software. All technical jargon aside, this synth runs great. It integrates into other programs nicely without a hitch. Analog Laboratory could use a lesson in that. The sounds simply inspire. You can tell the presets were painstakingly created with the user in mind ie: you don’t get those everyday presets that most companies throw in there for filler. I found myself having to stop the actual review process to create new material, which is the ultimate testament to any piece of gear. I’m a huge fan of rhythmic synth sounds to use as base layers and their gate and arpeggio section is extremely easy to use as well as versatile. You can take a factory preset and make it all your own within seconds of simply using those two features. I especially like how intricate you can go into the gating process without having to click through a bunch of menus. It’s all simply right in front of you. The browsing feature is very simple as well, giving you an option to choose by section by clicking on the screen, or by the Program and Bank buttons. The buttons make searching for sounds much easier whereas, if you know the sound you want, pulling it up is right there by clicking on the LCD screen above it. Organization is key. When it comes to making your own presets, I prefer this one over 90% of my other soft-synths. I’m no pro when it comes to sound design but with Saurus, everything is just… right there. They’ve taken the guess work of extra knobs out of the equation and traded it for seamless simplicity. You don’t always have to control every aspect of the sound design process to get unique sounds, so just let the brains at Tone2 handle the technical stuff. Just sit back and enjoy the sound design process. All buttons and knobs are very clearly labeled and organized in a truly obsessive fashion (in a good way). The GUI is very appealing too. They didn’t let the quality of the synth program outshine the look either. Just like you usually are more reticent to buy an album if the artwork looks shoddy, the same goes for software. If your eyes get tired, you get tired. Kudos to Tone2 on making it both beautiful and beautiful sounding. My only complaint is the Pad section of presets and that it isn’t a standalone for Mac. I usually jump off from one preset and tweak it until I’m happy with it, but I found that most of the pad sounds were very similar. I love depth and detail and space in my pads, but these seem to just be right on the verge of being there, but I just couldn’t get the to sound like I want. The leads…. perfect. The Arpeggio and Gate section… perfect. The Chip section… extremely useful. I just wish they had more presets in that bank. Overall… I love the program. It truly is a great synth that captures modern and vintage sounds all in one program. Also, it’s extremely cost effective quality, coming in at just $120.00 US. Your wallet and wife won’t be complaining too much, given that other synth programs like this are double the cost. A huge hats off to the guys at Tone2 for not charging more, they very easily could’ve. So if you’re looking for a new weapon to add to the arsenal, I would be completely confident saying to go ahead and buy this world class synth.